I was lucky enough to get to read this book and share it. How sweet of a story. 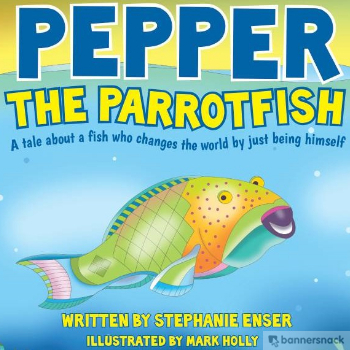 My household enjoyed this lovely story of Pepper The Parrotfish. We loved learning about how parrotfish help keep the ocean going strong. Hint: Without them, sand would suffer. Definitely a tale for younger kids to learn how important marine conservation is to the Earth. Best new though: I've got a code for my readers to save $5! Surprise your little one with Pepper The Parrotfish! This educational picture book for ages 3-8 delights children and parents as they learn what makes the parrotfish a special part of our planet. Part of the proceeds will be donated towards marine conservation. Free Shipping for a limited time only! Colorado local author and illustrator. Go here to purchase: Click me!